If you’re looking to buy a new or used motorhome, you’ll likely want to find a dealer who is able to offer you the best deal for your budget. Make Liberty RV part of your search for the right dealership to work with and maximize your finances. New 2018 models of top name travel trailers are in stock at Liberty RV. Come in and check out a new Cherokee, Springer, Bullet, Premier, Rockwood or other RV. Shop the Sanibel blowout clearance event over the Liberty RV website or call a sales agent for the lowest price on a new RV. Have a trade-in model? Liberty RV can offer you the most for it when you trade in your current motorhome for a new one. Take a moment and fill out the online trade-in form to provide the details of your travel trailer, including the year, make and model #, whether you purchased it new or used, and condition of the interior, exterior, and mechanics. Don’t forget to include what type of RV you’re considering trading in for, and finally, add any additional information you think would be pertinent to the exchange. Someone will get in touch with you promptly about your trade-in to discuss terms. You can save a significant amount of money on your next Lees Summit motorhome when you opt for a lightly used 2017 model, like the Forest River Cherokee Arctic Wolf at Liberty RV, an incredible deal right now at $5,000 in lot discounts. This is an RV that will sleep 7 comfortably and make family travel everything you dream of. With double slides for additional space and an outdoor kitchen that will maximize on the roominess of your adventure, the Forest River is a spectacular deal. Visit online to see the floorpan or call a sales specialist from Liberty RV at 816-415-CAMP. You’ll absolutely love adventuring in one of the most luxurious motorhomes on the market today. If you need parts or service to your RV, Liberty RV is once again the place locals turn to for affordability. Call the dealership or connect over the website to locate hard-to-find parts for your travel trailer and save yourself a lot of time and hassle. For reliable service, bring your RV in to the Liberty RV service center where you’ll find the best technicians in the business. With more than 70 years of combined experience in servicing Lees Summit motorhomes, Liberty RV is uniquely qualified to work on your model. Trust your next RV purchase to Liberty RV and discover the advantage of working with a local agent who is committed to your 100% satisfaction. As a locally owned and operated company, Liberty RV is passionate about helping their customers find great deals on Lees Summit motorhomes at the lowest prices available. 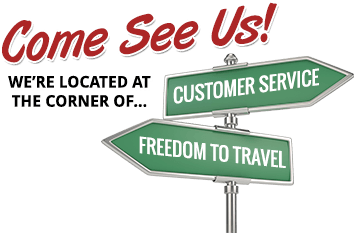 Make a call to Liberty RV now or stop by the lot, just outside of Kansas City for your convenience- you’ll be glad you did!